Product prices and availability are accurate as of 2019-04-18 20:05:04 BST and are subject to change. Any price and availability information displayed on http://www.amazon.co.uk/ at the time of purchase will apply to the purchase of this product. 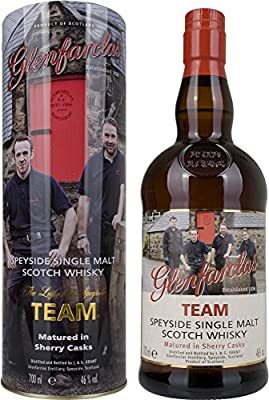 "70cl / 46.0% - The Legend of Speyside series is a trilogy of collectible bottlings of Glenfarclas single malt released for the German market. This edition honours the team that makes their wonderful whisky, which is matured in Sherry casks for this release. Nice work, team."